They say that images are worth a thousand words and we truly believe it! Pictures can be a true source of inspiration. It is through images that we find ideas and suggestions, which we can reproduce in our very own houses. In addition, it gives us the encouragement to transform spaces. This is why on homify, we share daily articles packed with images that are designed to help you so that you can improve your home. We have a gallery with 11 absolutely incredible interior images. We can't even choose which one is our favorite because every single one represents brilliance, personality and good taste. Perhaps you'll be able to pick your favorite? This interior space stands out for its uniqueness. 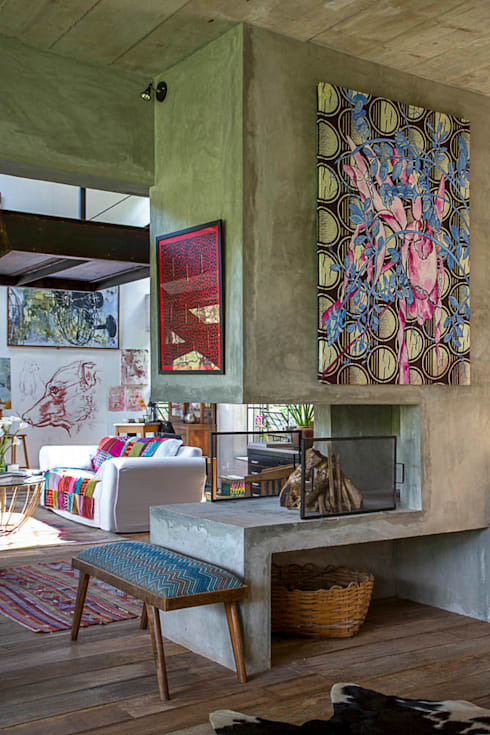 The cemented walls are quite rough, but have been co-orindated with colourful and vibrant details, including modern pieces of art. 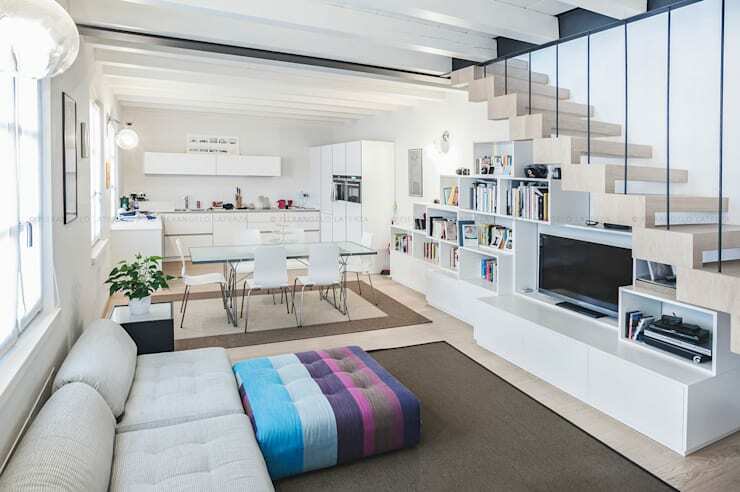 The white sofa attracts our attention thanks to the natural light that streams into this space. The colourful and diversified pattern of the blanket gives it a more fun touch! A space that features neutral tones where white dominates can be effective, timeless and classic. But why don't you add a more daring detail and a touch of vibrancy? As we can see in this image, a bright and colourful puff or ottoman adds a gorgeous and complementary touch to this interior design. Do you see how small details make a big difference? 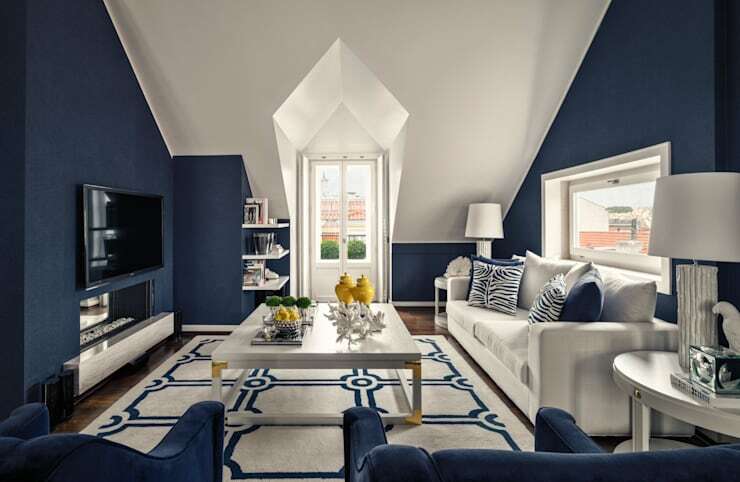 This Lisbon apartment features a very special touch. The past and the present come together, creating a personal and unique design. Antique pieces are used in conjunction with contemporary furniture, creating a true work of art! There are some spaces that don't need lots of details or designs because the architecture speaks for itself. 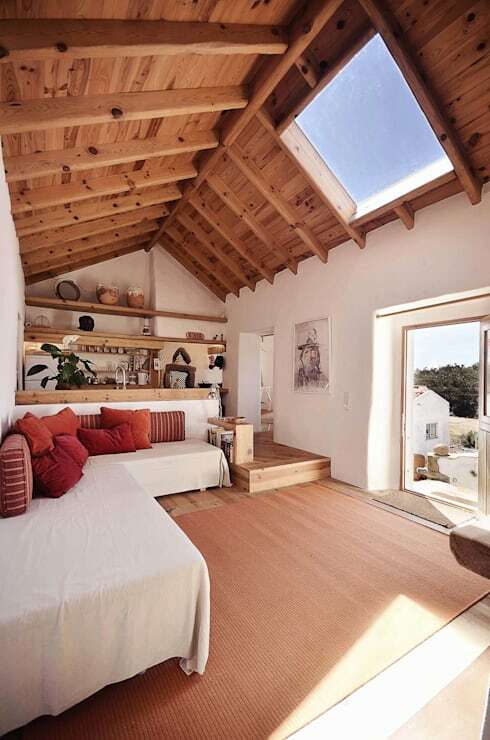 This is most certainly the case in this house, where the wooden roof is very exotic and the skylight illuminates the space in a very particular way. This is a very special space, which captivates from the very first moment thanks to its uniqueness. 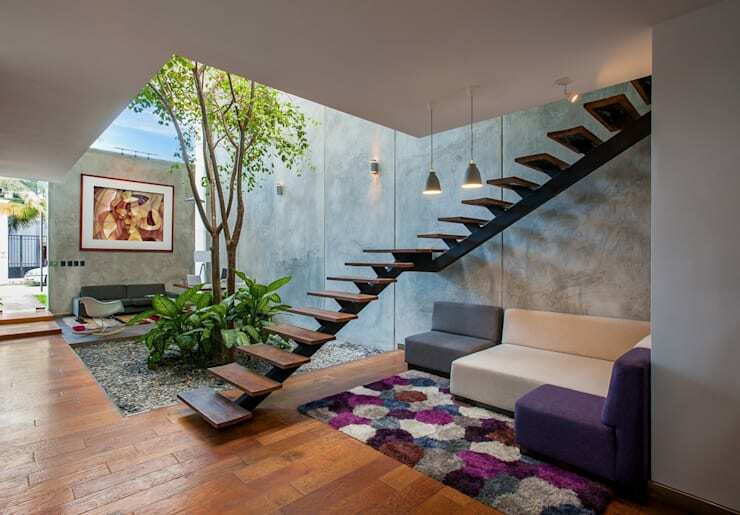 Designed by professionals Desnivel Architects, what is most striking about this home is the interior garden. It features grey gravel, plants and a tree as well as a large skylight, which allows sunshine to stream into the interior space. There is also a very majestic wooden staircase with a modern, avant-garde design. 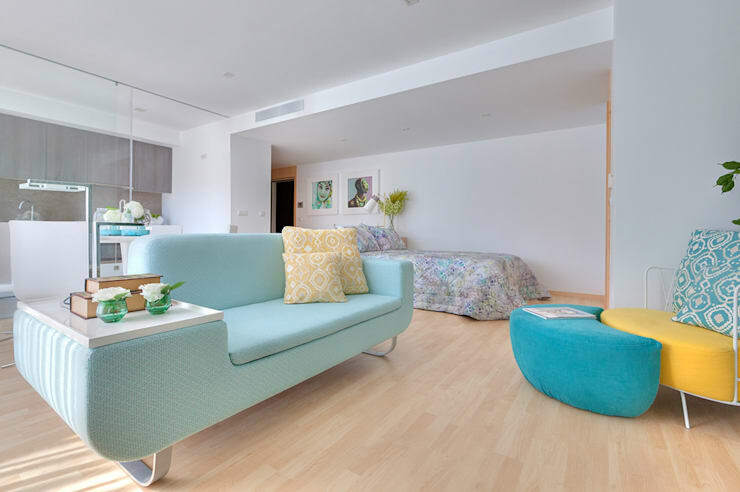 A distinctive sofa merges function and style, matching the colourful rug. These details create a very enchanting space. 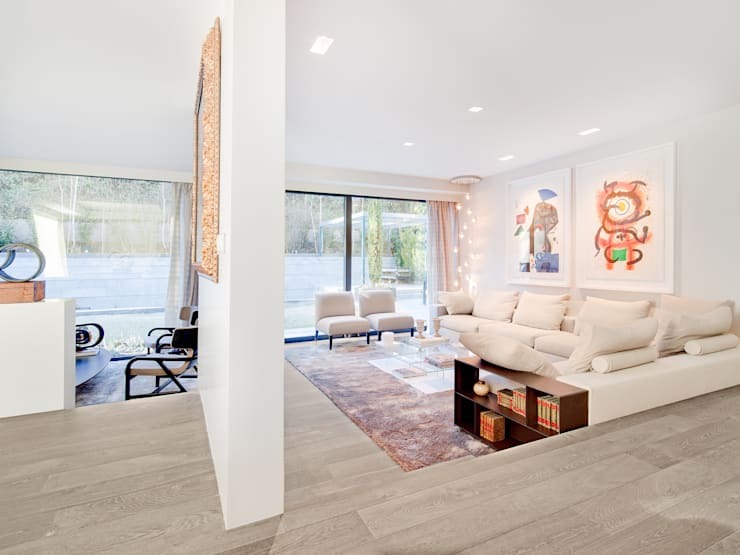 If you like white, radiant and luminous spaces then you will surely enjoy this living room and interior space. 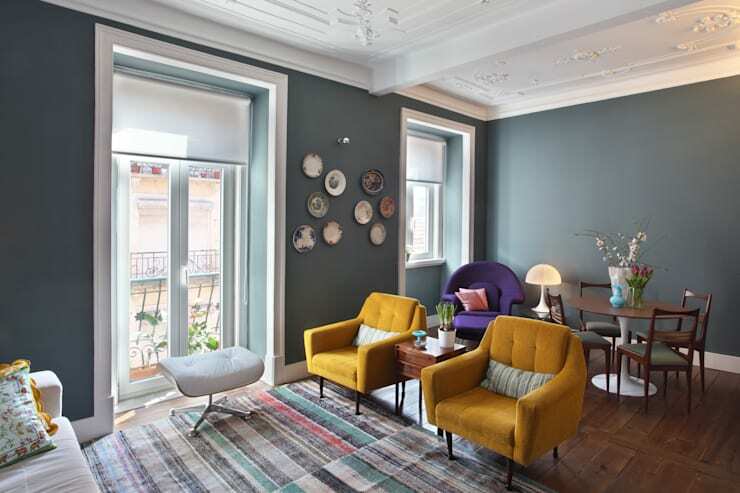 Light tones dominate the environment and are used for the walls, the sofa, the armchairs and even the paintings. However, we can also see how touches of colour have been introduced into the space subtly. Tip: Add dimming lights to your ceiling for a beautiful ambiance. There is no doubt that this interior is made up of several remarkable and special elements including the lamp, wallpaper and niches in the wall. Even the mirror and statue of the dog give this space personality and charm. 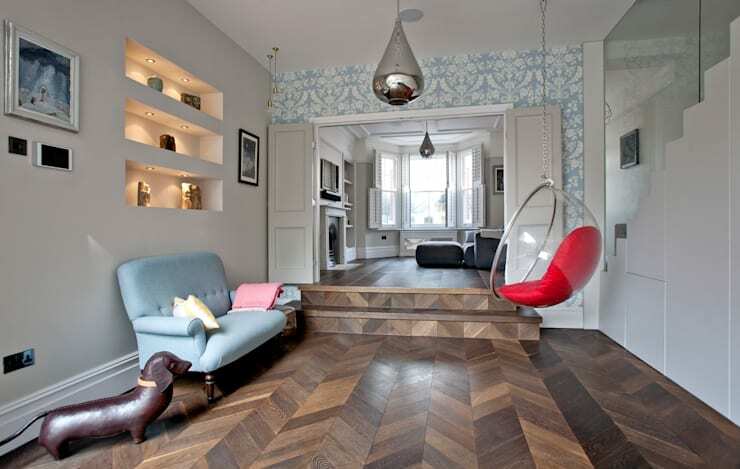 This is a great example of how a mixture of styles and designs can work very well, creating a room full of good taste. 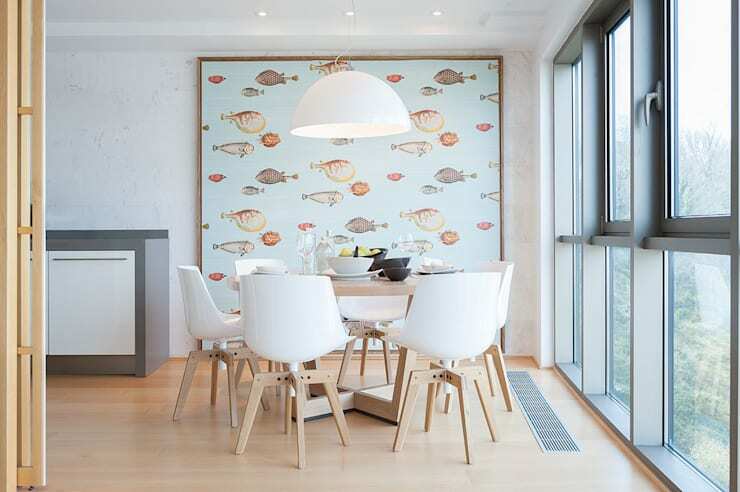 A round table, trendy chairs, a stylish lamp and a giant frame of fish – this is the perfect combination! A small space can sometimes be a headache to decorate and design, so why not open it up and let the kitchen, dining room, living room and bedroom all flow into one another? Do you see how these spaces are subtly separated, yet there is still a sense of space and interaction? 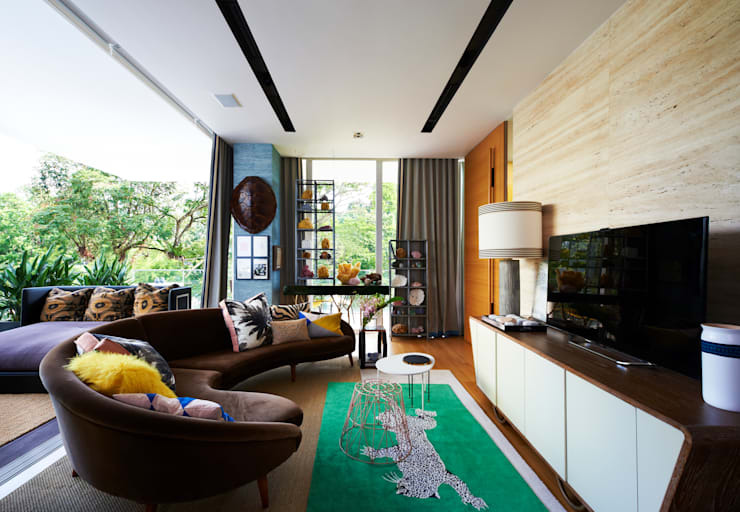 In this image, we come across a narrow living room that has been utilized thanks to the curved sofa. We can also see how a large window connects the interior and exterior spaces, extending the living area. This is a very interesting and inspiring home. This is another very happy and inspiring design, where a combination of two colours have been chosen: white and navy blue. This creates a maritime look and feel, which has been executed with elegance and charm. If you've enjoyed this article, you'll love this one: Boring interiors? 6 ways to improve your home decor immediately.